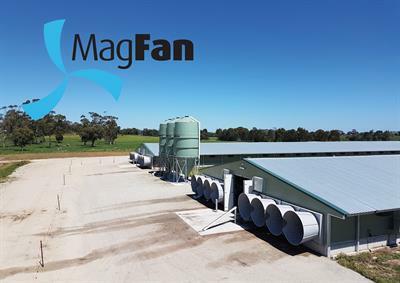 MagFan comes out on top in comprehensive fan efficiency report! 12.12.2018 -- AgriFutures Australia has recently completed an independent report on the importance and advantages of using Variable Speed Fans for Intensive Animal Farming. AgriFutures Australia: 'Studies have shown that one of the biggest on-farm expenses for chicken meat farmers is the power consumed by the exhaust fans. Energy prices are rising and the need to invest in new technologies and methods to reduce power consumption is paramount. Agrifutures Australia published their report Variable-speed exhaust fans for meat chicken sheds in December 2018. The below tables, taken from pages 8, 15 and 16 in the report, summarize the findings. No comments were found for MagFan comes out on top in comprehensive fan efficiency report!. Be the first to comment!